Setting up rental audio equipment still gets even the best of us. We gurus still forget that occasional extra extension cable or do something silly when we balance the sound system. It’s never a pretty sight. Worst of all, when you screw up something with a sound system everyone notices because of how loud it is or how embarrassing it is when it doesn’t work. 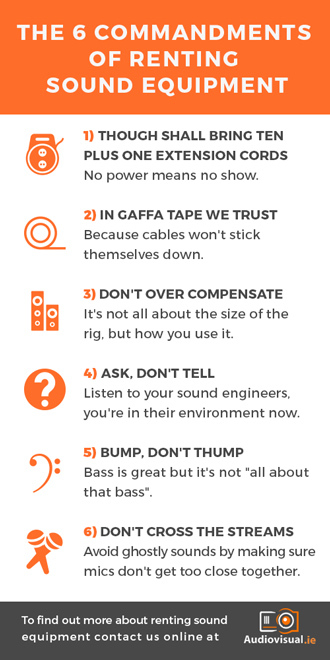 So, with that said, here are “The 6 Commandments of Renting Sound Equipment” that you must abide by to eliminate 80% of all problems before even getting started. Never find yourself short of extensions cords and socket boards. It’s the age old story. You pick up the sound equipment from the rental store, haul it to the venue, lay out the wires in a nice and tidy fashion, only to find out that you’re just a few inches shy from the outlet. Or worse, you might be an outlet short to hook up all your equipment. Don’t put yourself in that position. Always bring extra outlet strips and extension cords. It’s never fun to have to run out to the hardware store quick. You might laugh at it. You might despise it. Whatever your thoughts are, use it. Gaffa tape is a godsend to the audio visual world. It’ll stick in most places that you don’t want to go. It will also make nice and tidy work of all those cables hanging from the walls and running all over the floor. Always have a roll (or two or three) to hand. You don’t have anything to prove here. I promise she will love the size of it, whatever you might bring. You don’t need to overcompensate on the audio equipment. Don’t rent a bigger sound system than what is needed. It’ll prove to be too intimidating, both for you and others. It’ll also look horrid and won’t provide that pleasing experience you really want to provide. Get the right equipment for the right job. Sound engineers really do know what they are talking about. I promise you, they do. If you’re renting equipment, it means that you only need it for a temporary event. It also means that sound engineering isn’t your full-time profession. Listen to what the sound engineers at the rental places tell you. They aren’t simply just trying to sell you more stuff. They want you to have the right equipment. Let them help and listen to what they recommend. Bass is fun, bass is thrilling. Bass can fill up a room and get the party started but bass isn’t the only component in a good sound system though. Make sure to rent good, quality speakers that can provide a rich, full spectrum sound experience. The sound system needs to be able to rollover to different harmonic frequencies and balance frequencies gracefully. Though a lot of bass makes for a really good dance party, it’s not the only ingredient in the recipe for a great audio visual event. The above, although they may have provided you with a chuckle, forms the basis of what you really need to bring and remember to ensure your event goes off without a hitch. At AudioVisual.ie we’ve been renting sound equipment and providing expert advice for almost 50 years and if you’ve any questions, or commandments to add, comment below or feel free to give me a call on +353 1 4133892, e-mail me directly ivan@audiovisual.ie or contact us online!